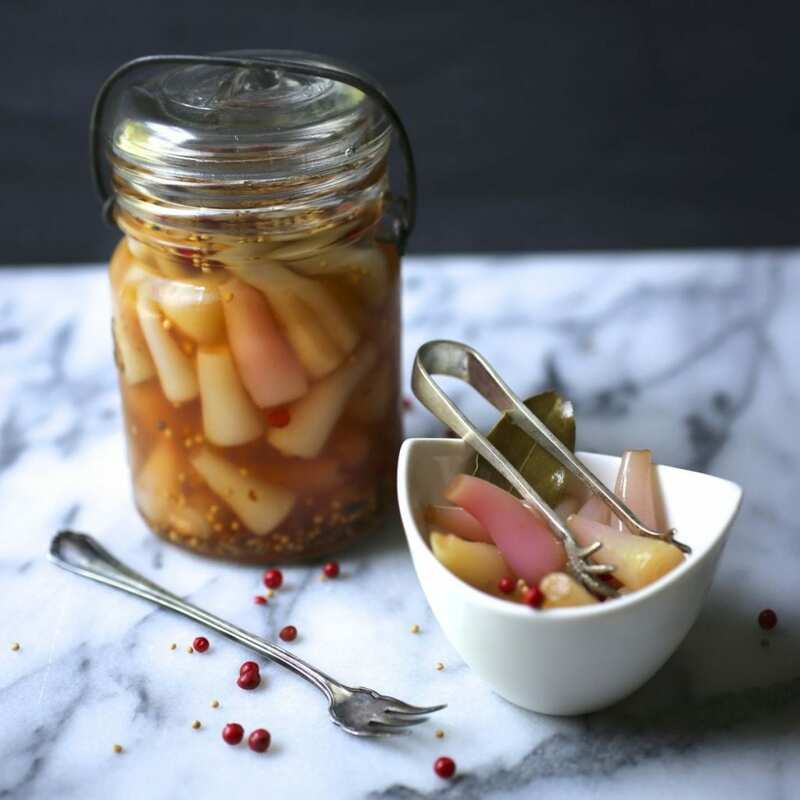 If life gives you ramps, make pickled ramps. 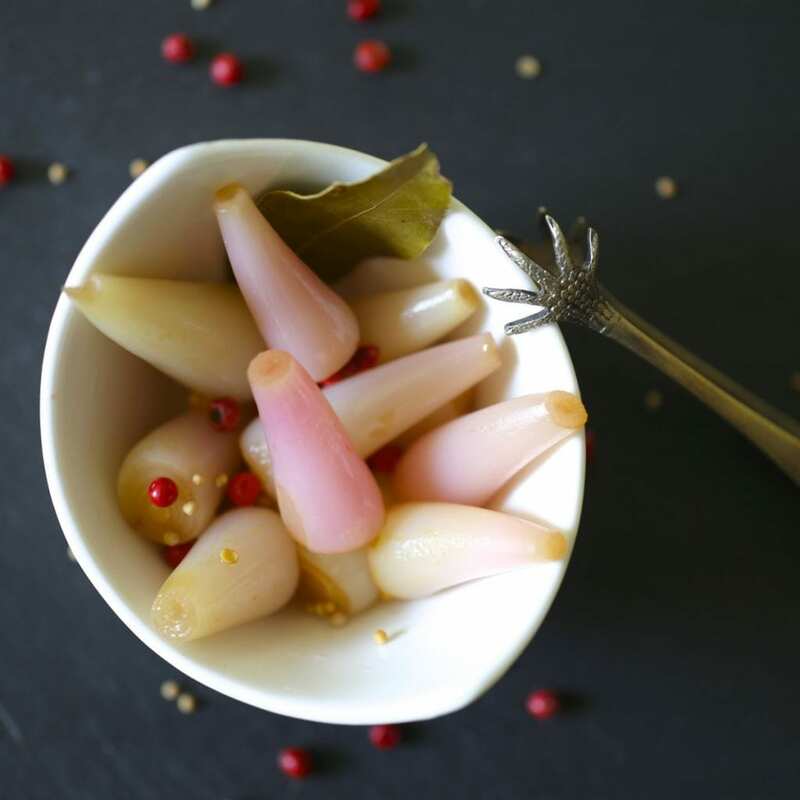 These garlicky bulbs preserved in a spice vinegar become a tangy crunchy substitute for pickled onions. Yeah, yeah. I know ramp season is over but I made these a while ago and they were so good I decided to blog them anyway. When it comes to ramps, it’s really the green leaves that are incredibly perishable so every once in a while, you can find just the bulbs for sale long after you stop finding the leaves. But what to do with them? You may have guessed that I’m fond of making pickles. What’s that? Oh, that’s just Matt running in to the room holding a jar of brined pencils, screaming “Obsessed! You’re obsessed”. Fine. Yes. I’ll admit it. I love pickled red onions, radishes, cucumbers, even grapes. So it should come as no surprise that when I found the last batch of ramp bulbs hidden away in a overlooked corner of our local market, I immediately decided to preserve them in a delicious, sweet/tart brine. You can use these pickled ramps anywhere you would use pickled onions (on sandwiches, tacos, bean dishes, etc). I also really love them sliced up in this Orzo Salad with Zucchini, Tomatoes, Olives and Feta. Clean your ramps well. They get muddy and sandy so make sure to peel the outer layer and give them a good rinse/soak. Just use the bulbs for pickled ramps but don’t throw out the leaves! The greens are amazing in pesto or risotto, in any kind of pasta, mixed with butter to top fish. Use any combination of spices you like (allspice and juniper are nice additions). Trim the root ends off of the ramps and cut off the leaves, saving the green ends for another purpose (like pesto or risotto). Rinse the ramps well under cool, running water. Bring a 2-3 quart pot of water up to boil and add 2 tablespoons of salt. Drop in the ramps and cook for 2-4 minutes, depending on size) They should be tender but not mushy. Remove and shock them in ice water until cool. Drain the ramps well and place them in a the jar you’re going to pickle them in. In a saucepan, combine the vinegar, salt, sugar, and water and bring to a boil. Add the bay leaf and all the spices. Turn off the heat. Pour the hot vinegar mixture over the ramps in the mason jar and let cool on the counter (30 minutes or so). Then seal tightly and transfer to the refrigerator. They’ll be ready to eat in a day or two. The refrigerated pickled ramps will last a few weeks to a couple of months.